Permit in hand, we wasted no time. We drove up that crazy road, Horseshoe Meadows Road, as it switchbacked over a mile in elevation up the steep eastern face of the Sierra. Great views from up there! We parked in what we hoped would be a shady spot and got ready to hike. We posed for a few photos at the Cottonwood Pass Trailhead and started blazing a trail. We had a long way to go that day. 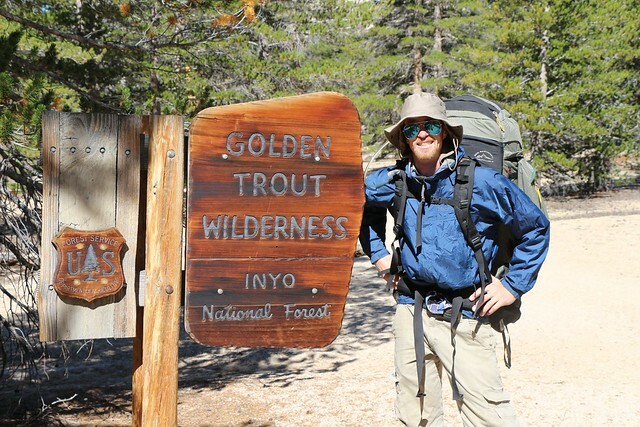 Not far from the trailhead we entered the Golden Trout Wilderness, a part of Inyo National Forest. No wheeled or motorized contraptions are allowed in the wilderness, which helps it maintain its pristine existence. At first the trail followed the edge of Horseshoe Meadows. The Trail Pass Trail veered off toward Trail Peak but we didn’t take it. It had been on our list of possibilities for this weekend. We stayed on the Cottonwood Pass Trail, which eventually began to climb, switchbacking up to the pass. Lots of great views back over the same Horseshoe Meadows that we’d seen along the way. We reached the pass and looked west into new country. 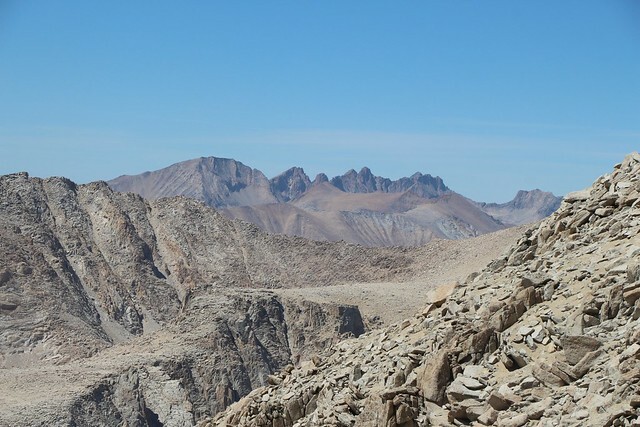 This was where the trail meets the Pacific Crest Trail. 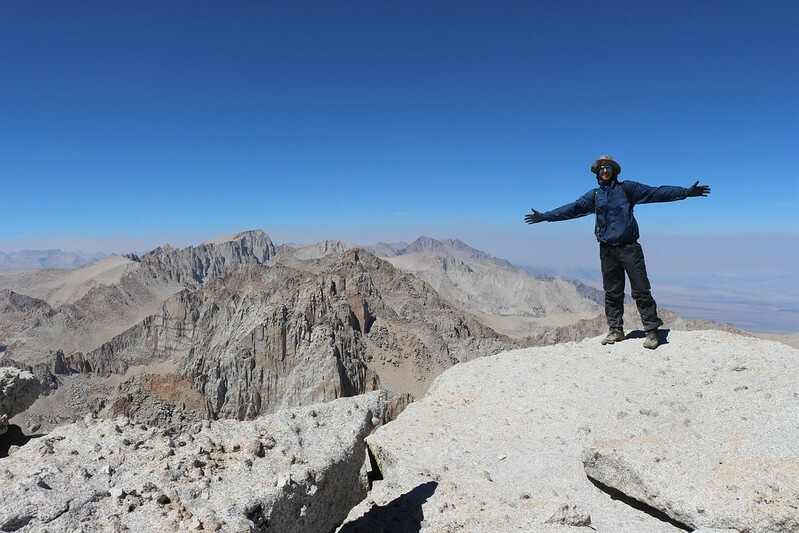 It was nice to see our old friend the PCT, and we looked forward to hiking on it. But first we had lunch at the pass, hunkered down out of the cold breeze behind some large boulders. There were great views from that pass, but we didn’t stay long, as we had six more miles to hike that day. Not far from the pass was Chicken Spring Lake. We hiked over to check it out. The water level was very low. 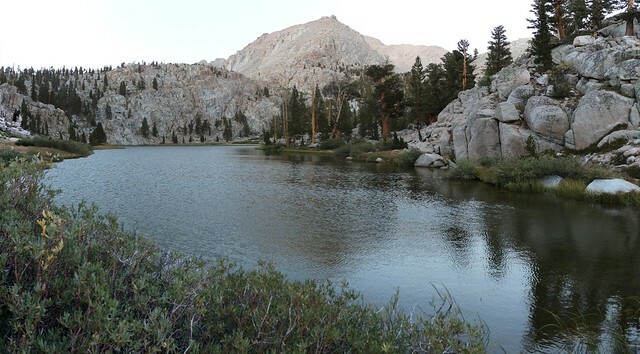 If we had been unlucky at the lottery and taken Trail Pass, we would have been camping at this lake. There were a lot of people already camped there. It would have been a crowded spot. So we hiked on. 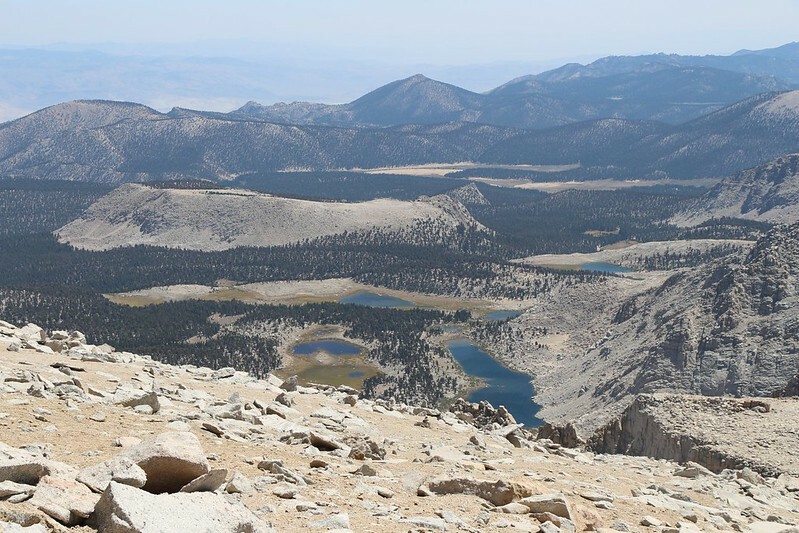 We climbed up above the lake and looked down upon Big Whitney Meadow. It was a huge meadow, in its own basin-like area. 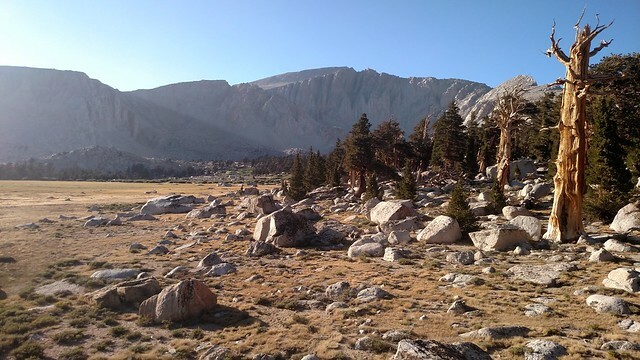 The trail gradually descended until we reached Siberian Pass, where we entered Sequoia National Park. At this point even dogs were banned, which prevents many folks from hiking there. New area, new rules. The next big item on our viewing agenda was the Siberian Outpost. What a name! It sounds like some sort of bleak cabin in the middle of the frozen tundra, but really it was just another huge meadow in a large flat basin. It was pretty, but we didn’t go down to visit. 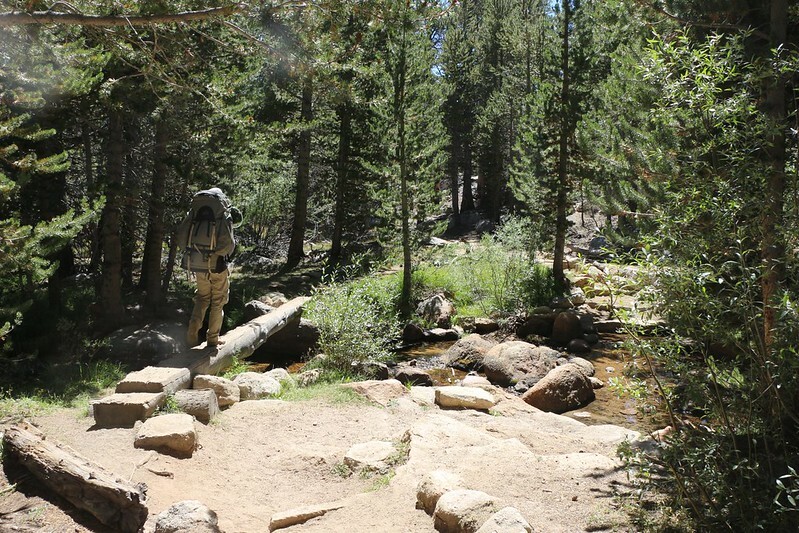 Eventually, after five miles, we left the Pacific Crest Trail for the Rock Creek Trail. This would lead us to our camp at Soldier Lake. Along the way we got great views of Mounts Mallory, Le Conte, Corcoran, and our destination the next day: Mount Langley. The other three mountains were sharp and pointy and looked quite difficult to climb, whereas Mount Langley looked like a massive pile of sand and rocks, huge against the horizon. 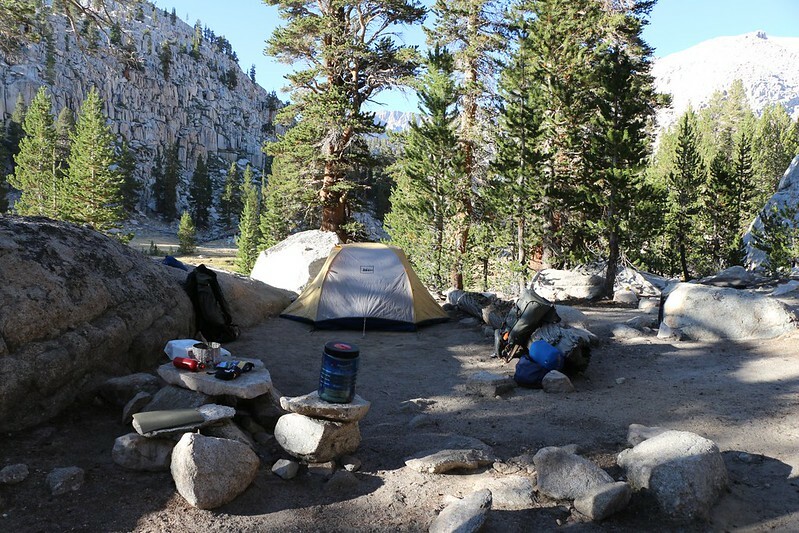 We set up camp in a really nice spot next to the meadow below Soldier Lake. I met someone I knew from an internet forum, which was fun. We ate dinner and then hiked up the meadow to check out the lake. “The Major-General”, a dominant ridge of Mount Langley, towered over the lake. Then we went back and slept like logs. I had gotten up at 1am that morning, and sleep was more than welcome. We woke up to frost on the meadow and ice on the tent. We had some hot coffee and took a walk back up to Soldier Lake, where we took some nice photos of dawn reflections. Then we went back and packed up our gear. 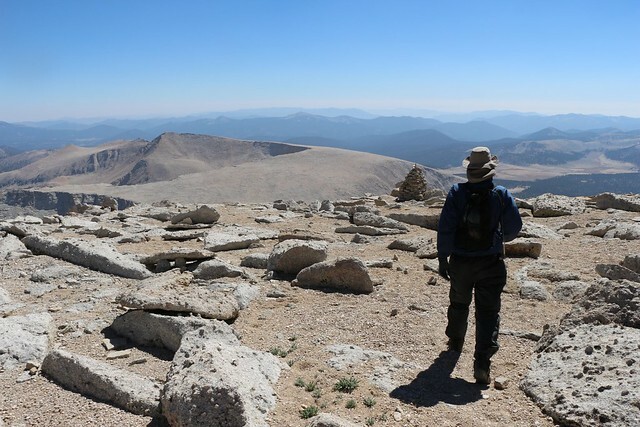 We had to climb about 1200 feet to get to the pass where we would leave our big packs, then climb another 2000 feet with only daypacks. We hiked back to the stream on the Rock Creek Trail, then turned left toward Old Army Pass on the New Army Pass Trail. 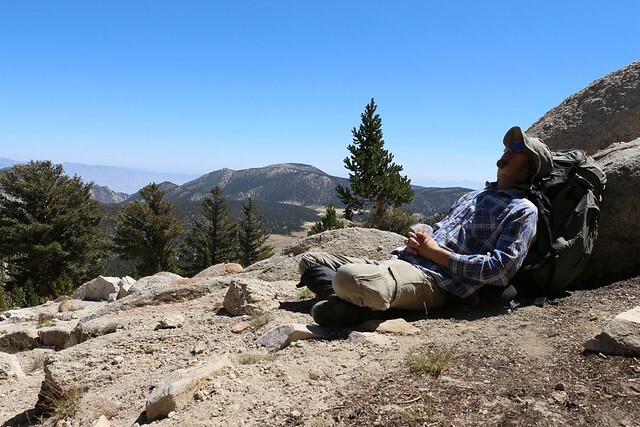 As the trail went up a canyon the trees got thinner and thinner, until finally we were well above the treeline. The views were great toward the west into the heart of Sequoia Park. It was still early, we had plenty of energy, and the mounting breeze was at our backs. Great hiking. 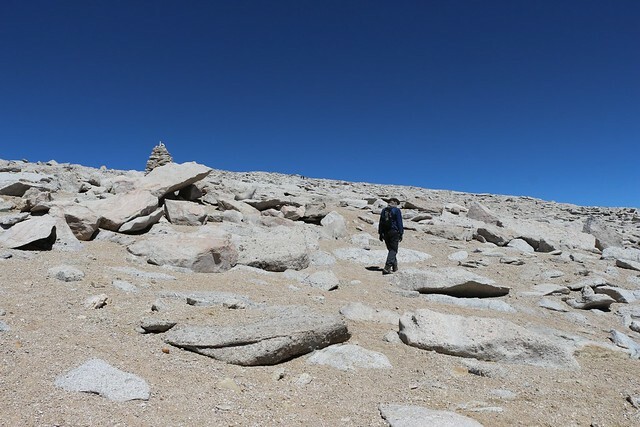 We got to the top not far from Old Army Pass and hunkered down behind a large boulder out of the wind. It was a cold, insistent breeze. 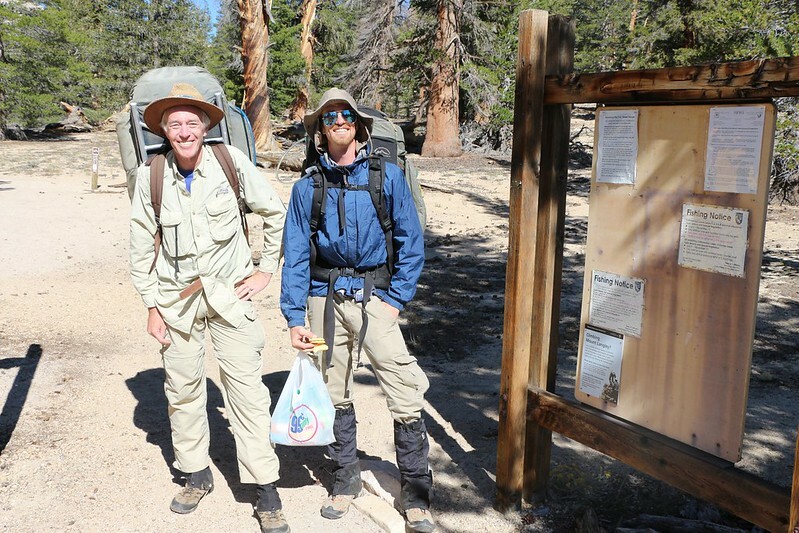 We put on our windproof raingear and made up some smaller daypacks with water and lunch. We then stashed our big packs behind the boulder on the windy side, where no one would see them. 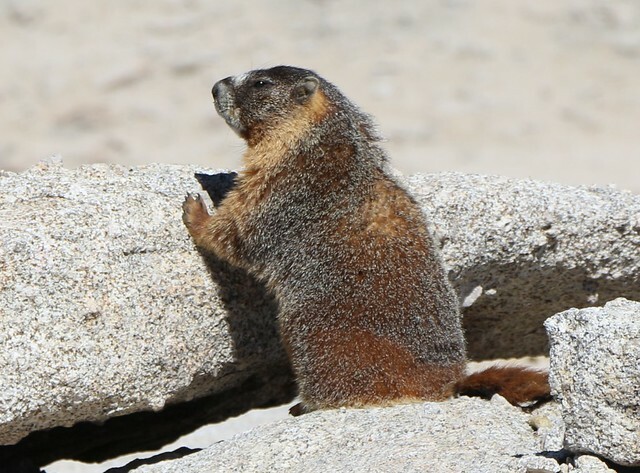 Marmot near the trail as we ascend Mount Langley. We hoped he’d leave our packs alone. 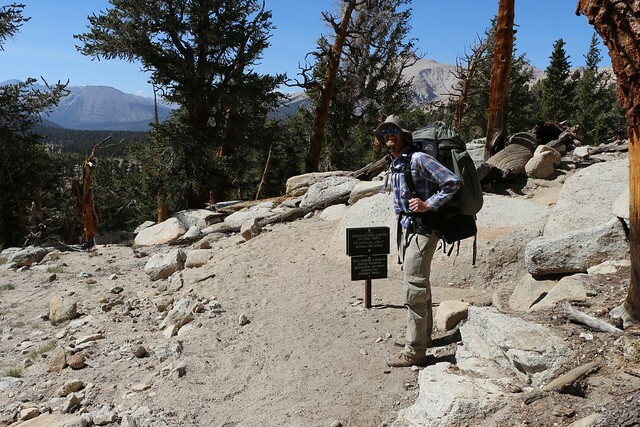 We ascended along the well-defined use trail toward Mount Langley. Others were already on it. 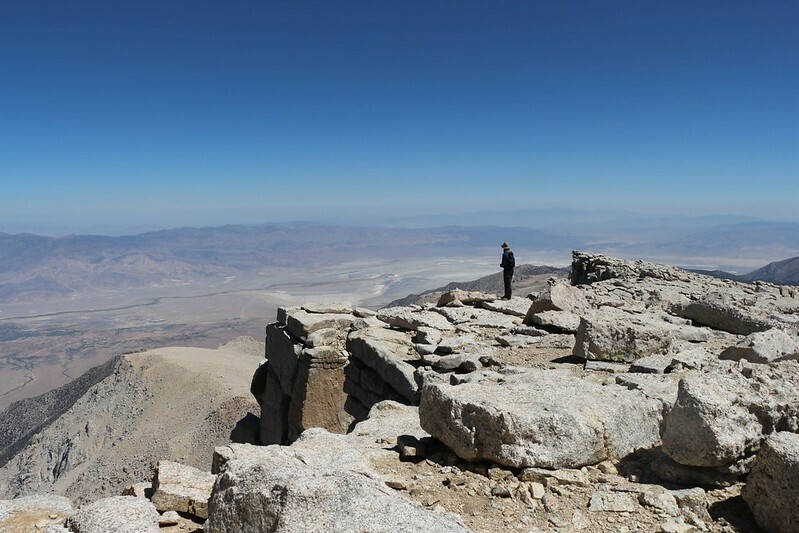 We weren’t likely to have this popular peak to ourselves on a Labor Day Weekend! 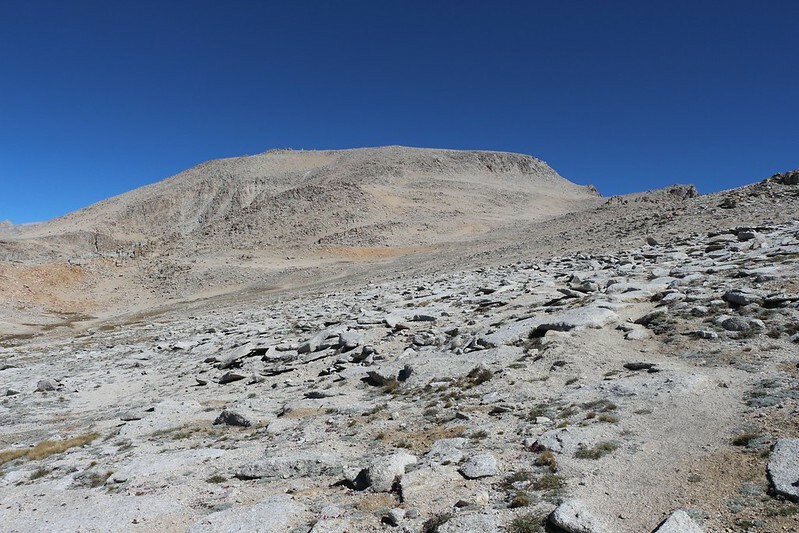 At first the trail ascended shallowly, as we approached the main bulk of the mountain. 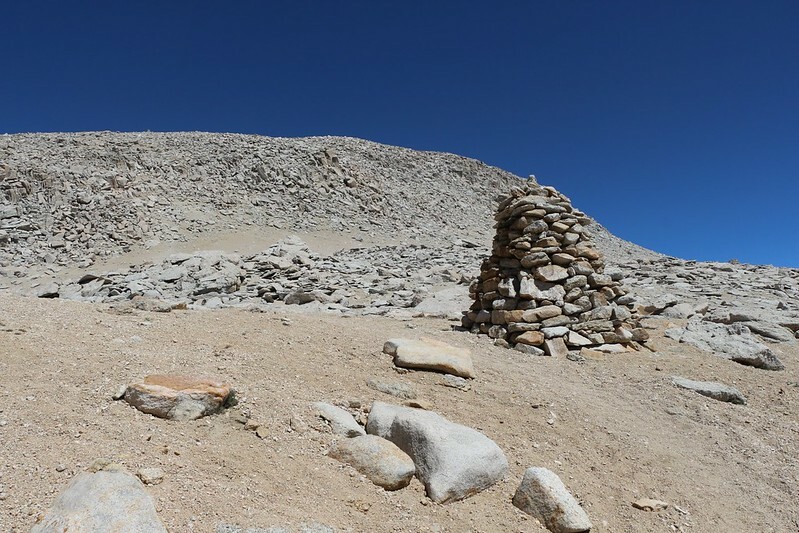 Once there, a sign told us of stone cairns that had been placed by the Rangers to help people climb the peak by the safest route. And the cairns were HUGE! Man-sized piles of well-packed stones. We had to admit that they were very hard to miss! Huge stone cairn marking the Mount Langley Trail. They were hard to miss! And so we hiked on, from one far-spaced cairn to the next. There were plenty of footprints between the cairns making the trail quite obvious. Still, it was both comforting and terrifying to see the cairns. 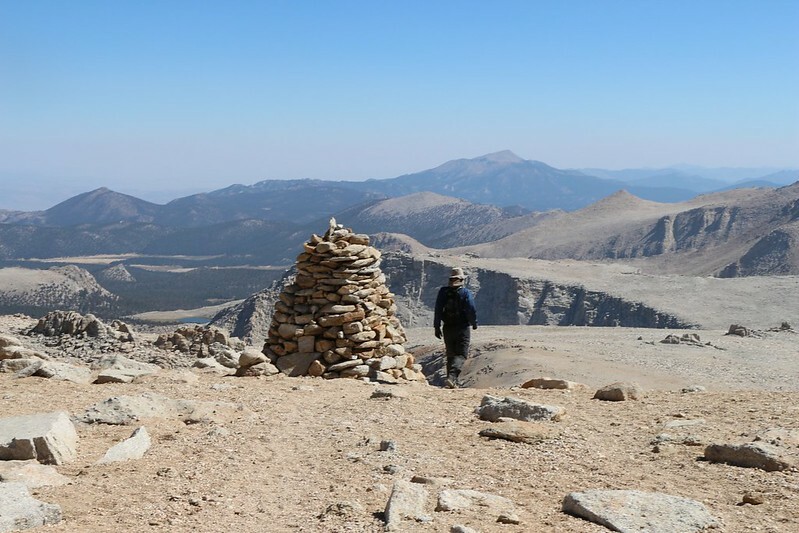 On the one hand, they were milestones that you could judge your progress by on this otherwise nondescript sandy slope, and on the other, there was always another cairn in the distance, far away above us, way up there on the ridgeline, an impossible distance away. Still, by continuing to plod onwards, another cairn would be passed. Our legs began to get tired. They were running out of fuel. We kept stopping for short rests, as the trail was steep. It was sandy, so you’d take a step and your foot would slide back a little. One step forward and a half step back. It sapped your energy, somehow. The lack of air didn’t bother us much, as we both have good lungs, but we were definitely breathing hard. Along the way we were treated to some great views, which we were happy to take, using the views as ready-made excuses to rest our tired legs. One direction was looking down into the Soldier Lakes area where we’d spent the previous night. We saw a possible path up from there, but were glad we’d taken the trail instead. To the south we saw the Cottonwood Lakes Basin, where we’d be camping that night. 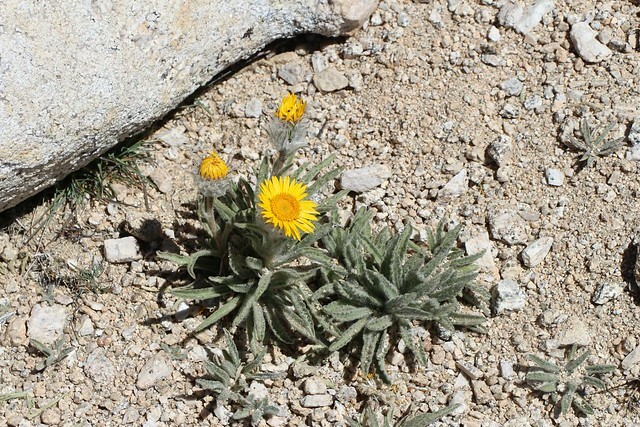 We also saw a couple of flowering plants up at these high elevations, notably the yellow Alpine Daisy and also the pretty blue cluster of flowers that marks the Polemonium, or Sky Pilot plant which only grows above 12000 feet. 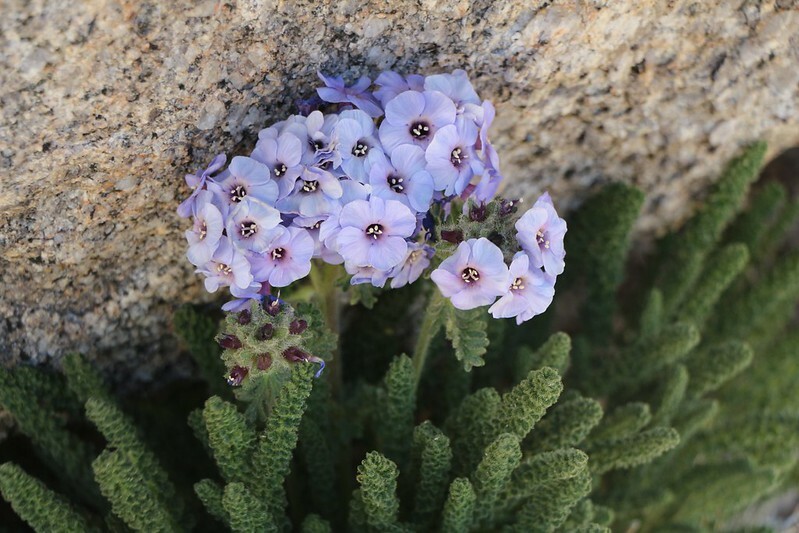 Polemonium (Sky Pilot) flower at 13,500 feet elevation. Eventually, we passed the final cairn, and there wasn’t much further to go. But it took a long time anyway. Still, we reached the summit at last. 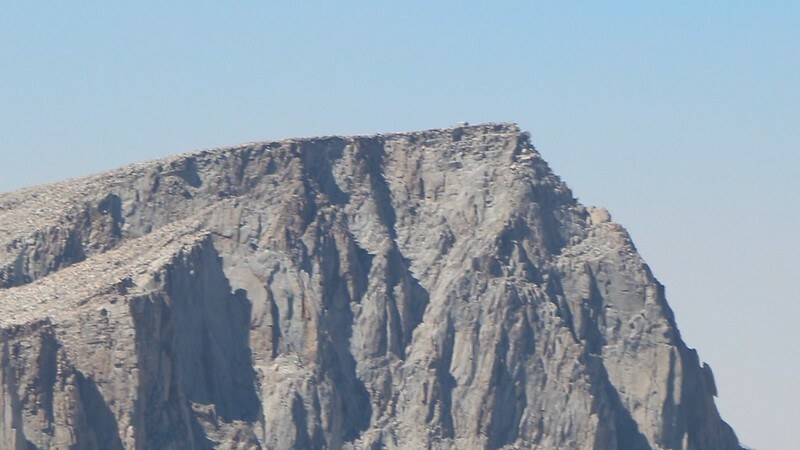 Mount Langley, at 14026 feet elevation. 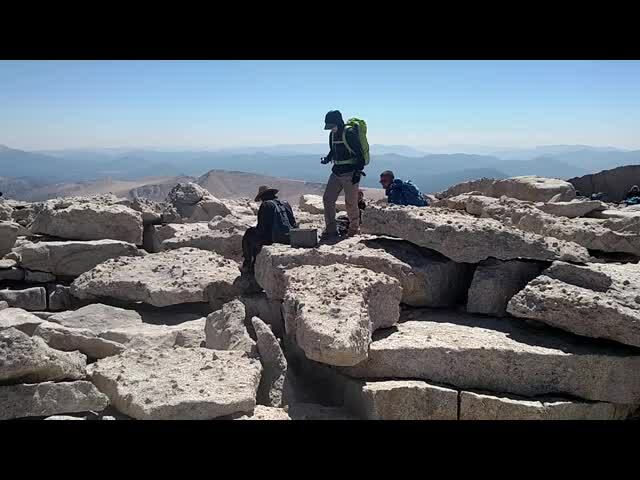 My son was now a fourteener! And he was happy about it, too. 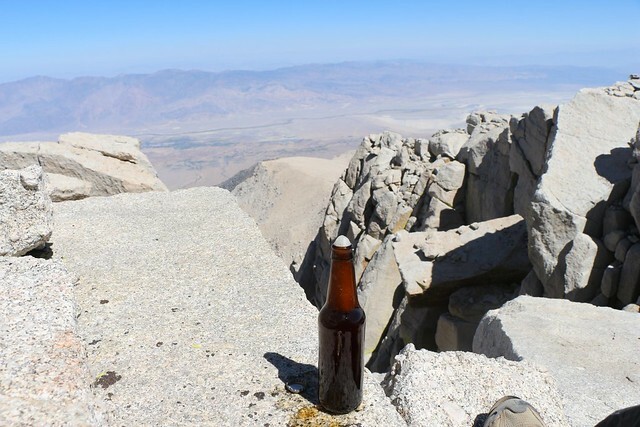 We searched a bit and found a nice lunch spot on the summit, someplace out of the wind. It was just below the sharp edge of the mountain, which dropped in a 1000-foot cliff to the north. All that sloping sand on the south side, and a crazy steep cliff on the other. But that’s the Sierra Crest for you. We each had brought a celebratory beverage with us, and we downed them with our lunch. This meal brought renewed energy to our bodies. And we needed it. 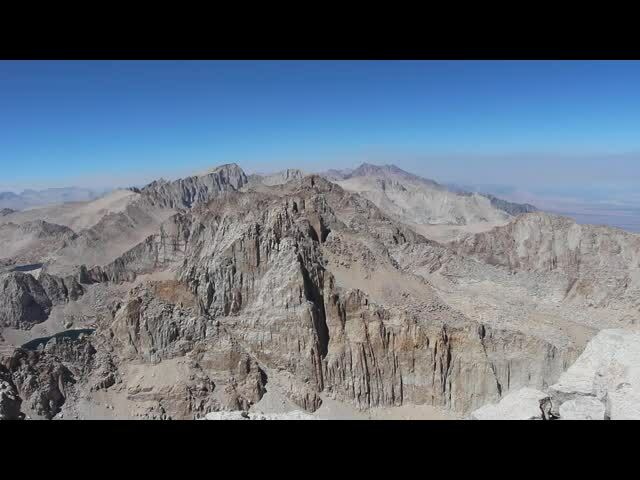 We took one last view of Mount Whitney to the north, five miles away, and tried to imagine all the hordes of people up there. By the time we’d finished lunch, we were the only ones on Langley’s summit, though we could see a few more slow-moving stragglers plodding upward from the last cairn. And then we said good bye to the peak and began our descent. And, yes, it had been a long slow slog earlier, heading uphill in the loose sand, our leg muscles aching and complaining for what seemed like hours, but heading back down more than made up for the pain! We had a blast, taking giant steps, plunging our heels in the deep sand, smiling the whole way. We were telling other climbers not to worry and that they were almost at the top (even though it wasn’t true) as we ran past them, laughing. But the fun ended all too soon, and we had to walk the final, flatter section back to our packs. We took a short break and re-packed our big backpacks. It was late afternoon by this time, and we needed to get moving if we were going to get a good spot to set up camp down below. 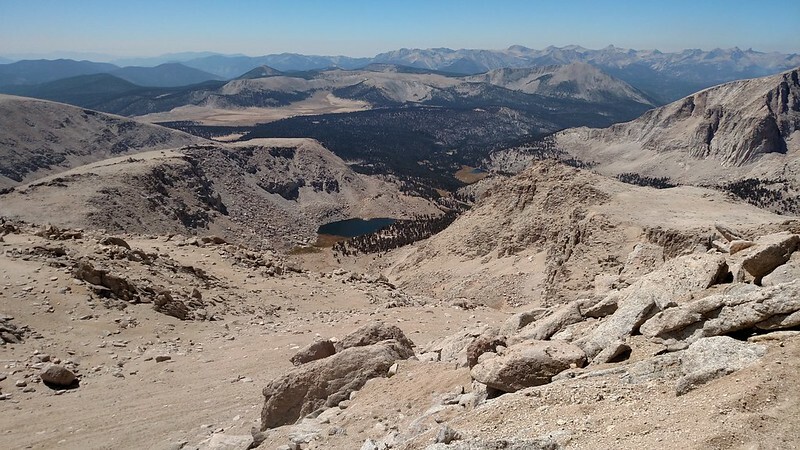 We stood on top of Old Army Pass and gazed down upon Cottonwood Lakes number 4 and 5. 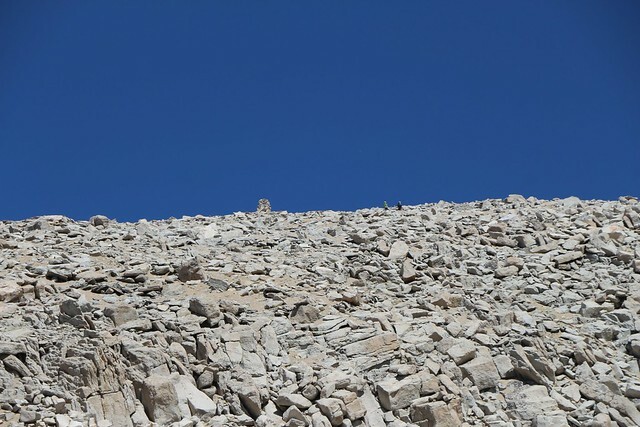 It was a very steep headwall and the trail picked its way delicately along the side of it, switchbacking when necessary and descending continuously for about 800 feet. 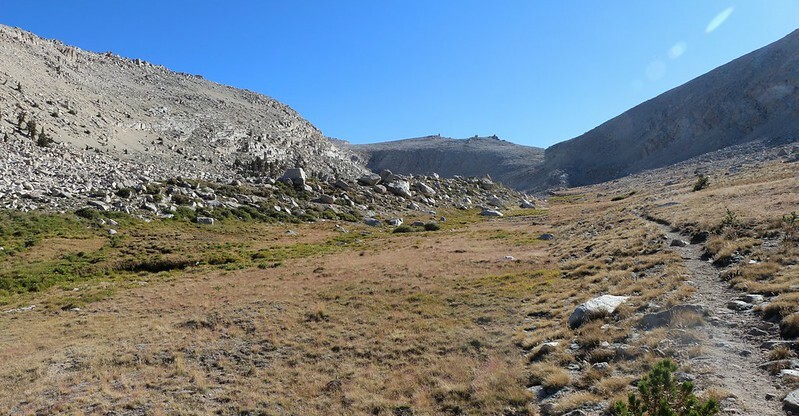 There was no snow on the pass, though there usually is on a typical year, but not in this year of drought. 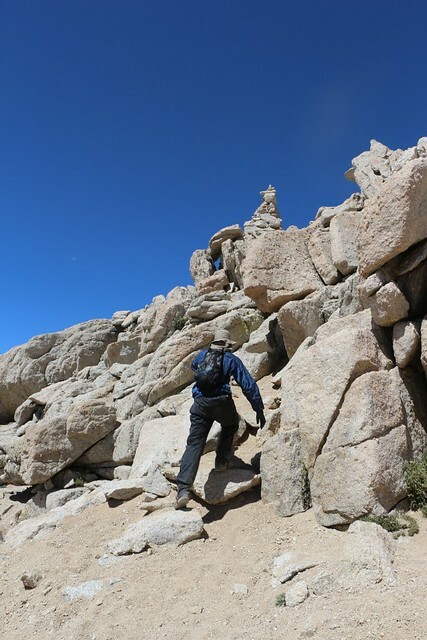 The trail was very easy to find, although it did have one spot near the top where there had been some big rockfall. We just stepped over the boulders like everyone else did. No problems whatsoever. Now, when we got our permit we told the ranger that we wanted to take Old Army Pass and he cautioned us against it, and strongly promoted New Army Pass. In fact, it appears that the “powers that be” have decided to start using one of their old tricks, by removing/renaming things on maps. They’ve already removed the Old Army Pass TRAIL from the newer maps, but now they’re going to change the names, and call New Army Pass simply Army Pass, and get rid of the old one entirely. Sneaky. We hiked along the shore of Lake 4 until we reached the outflow from Lake 5. We hiked over and scoped it out. There were some tents nearby so we decided to hike onward. We passed Lake 3 and headed out over the meadow to the east of it. We crossed it, then hiked down the eastern shore to a nice place near a small, unnamed lake. This is where we set up camp. We almost camped at Lake 4, just below the pass, but my son wanted to be able to see Mount Langley from our campsite, so that we could relax and contemplate it in its serene grandeur. And that’s why we had to hike yet another long mile in what had been a very long day. But the views were worth the extra effort. And we were on the opposite side of the little lake from the main trail, so we had the place all to ourselves. Very peaceful. We slept well and soundly, and got up early. We wanted to tour the lakes area on our way out, simply hiking along and exploring everything. 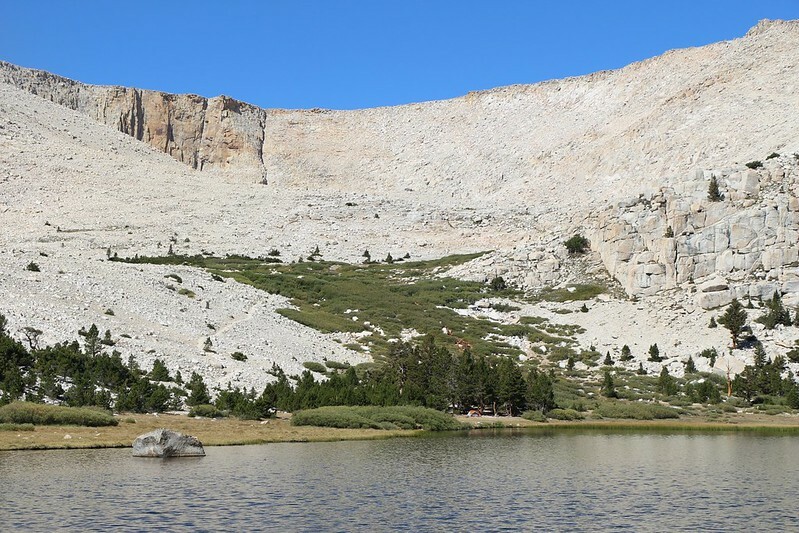 The Cottonwood Lakes Basin is truly a beautiful place. We woke up in the morning and kept all out warm clothes on while we made coffee and breakfast. It was cold! 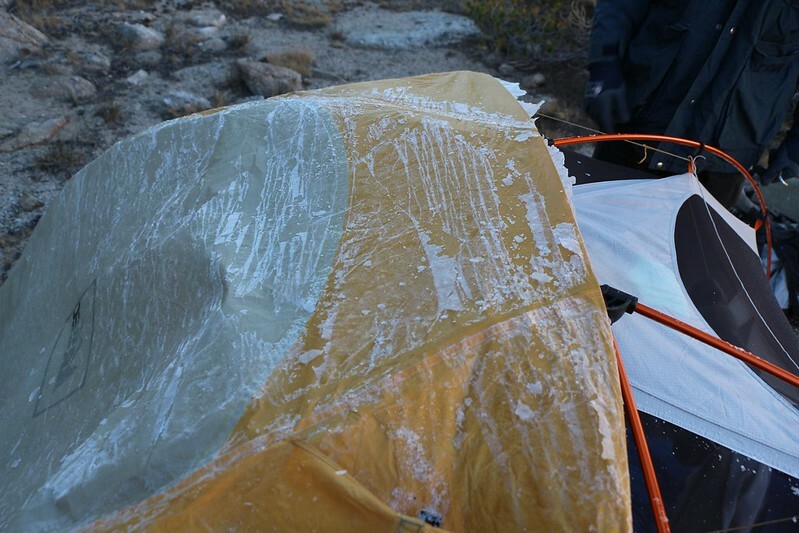 A continuous layer of ice had formed inside our tent from our breath’s condensation – we carefully removed the tarp, shook it off vigorously, and the tent stayed dry! This saved me from carrying out a heavy, soggy tent. Excellent! Too bad we had to freeze our butts off first. 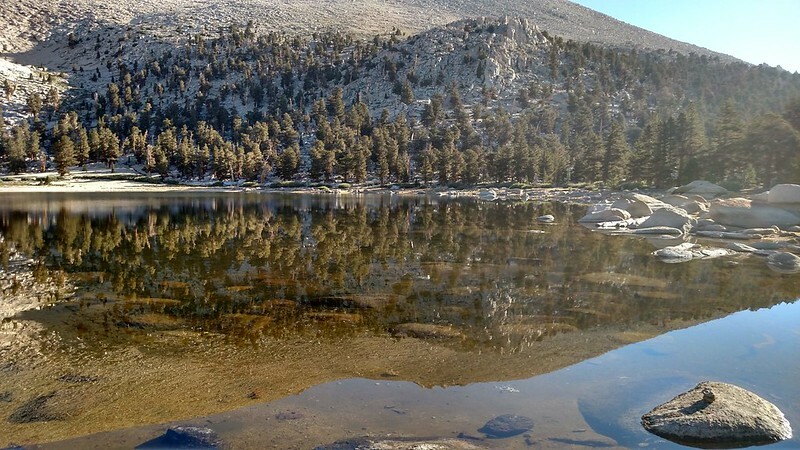 While it was still cold, we decided to take a quick dayhike over to Muir Lake. We took photos of the early morning reflections in the calm, still water. This lake was also quite low. We followed its dry drainage to see where it came out, and wound up heading south toward the marshy area east of Lake 1. 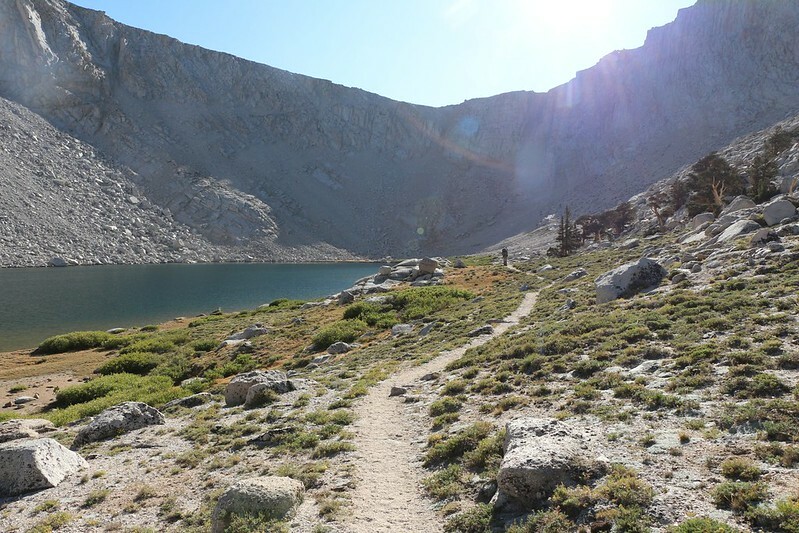 We intersected the main Cottonwood Lakes Trail and took it back toward camp. We got dressed for the day and packed up everything, then headed out for the final day’s adventure. Early morning reflections in Muir Lake. This lake was also quite low. We headed off cross-country to the lower margin of Lake 3, then followed the stream down to Lake 2. 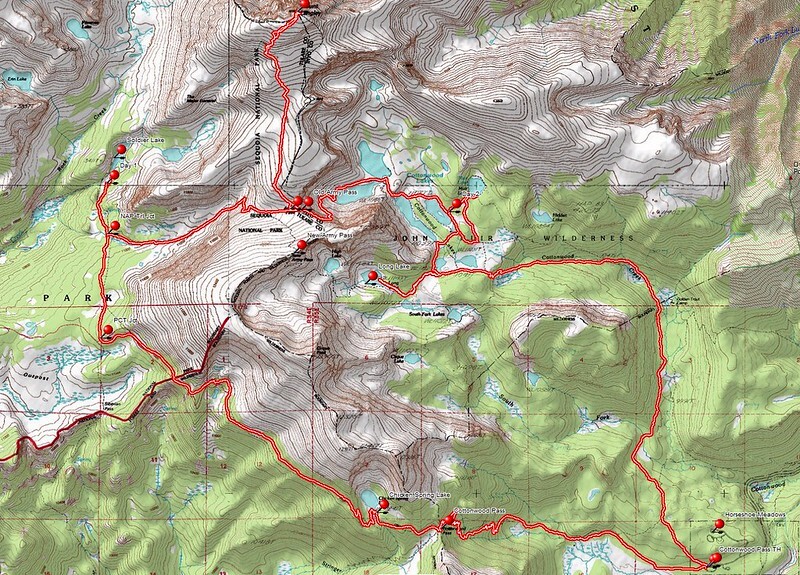 We stayed on the west side of Lake 2 until we intersected the main New Army Pass Trail. At that point we got out our daypacks and stashed our big packs, as we wanted to hike uphill to see Long Lake and New Army Pass. Along the way we crossed a gigantic Moraine Field of talus. 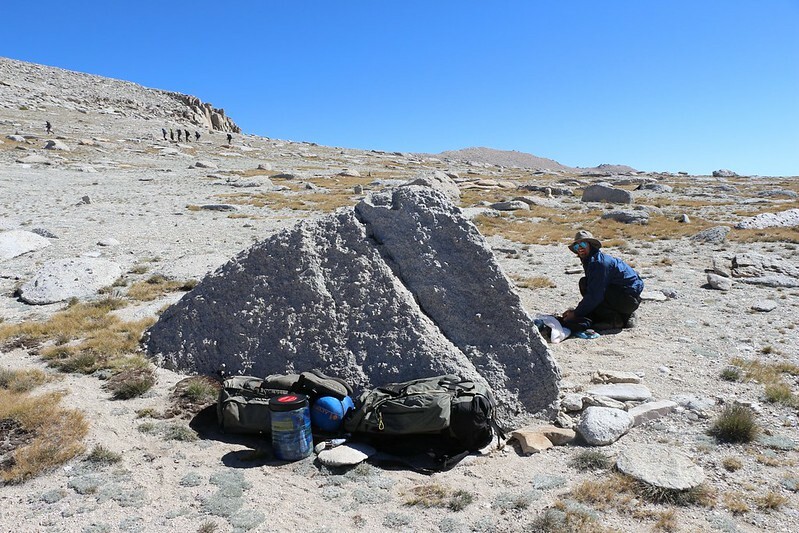 Huge boulders dropped by advancing and receding glaciers long ago. Amazing. 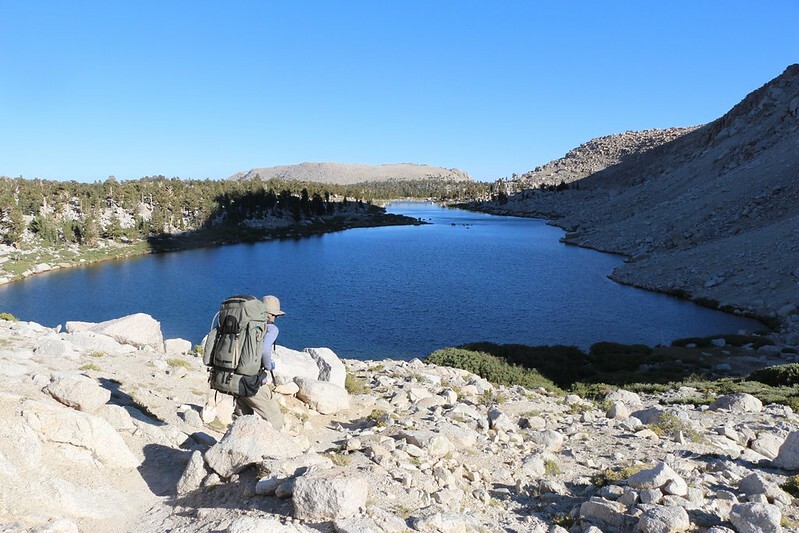 We hiked west on the New Army Pass Trail just far enough to check out Long Lake (the place where we told the too-insistent ranger we’d camp after descending via the so-called “Army Pass”). There were several really nice spots to camp, and the lake itself was deep and clear. We filtered some good-tasting water from that lake, and saw large fish swimming down in the depths. It was so nice it almost made me wish we’d listened to the ranger. Almost. I still liked our other spot better. 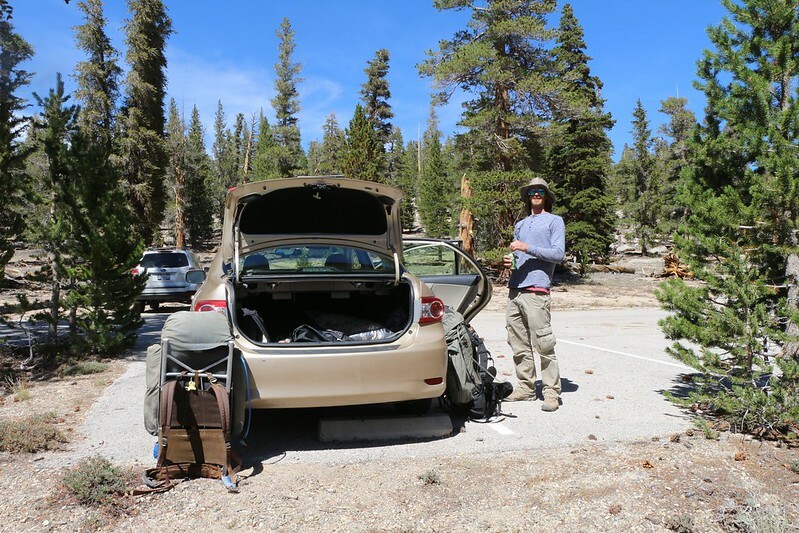 We hiked back to our big packs and began the final hike out to the car. We passed by Cottonwood Lake Number 1 and saw our final views of Mount Langley before dropping down into the Cottonwood Creek Valley. Good-bye Mount Langley! 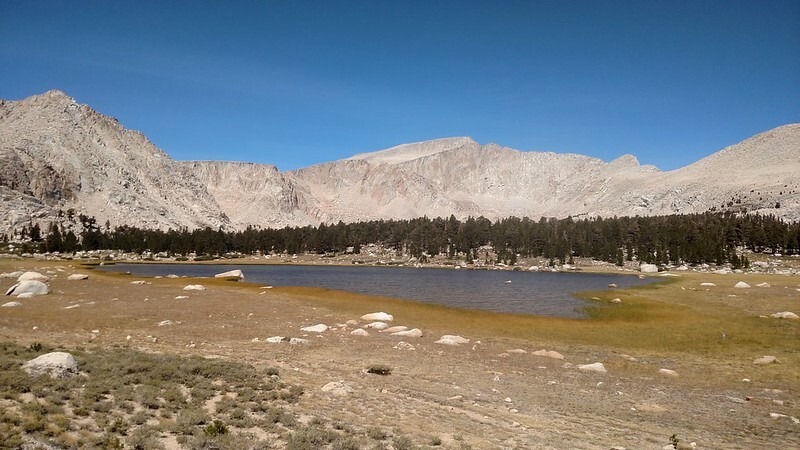 Cottonwood Lake Number 1 and Mount Langley. Good-bye Mount Langley! The hike through the valley was uneventful. 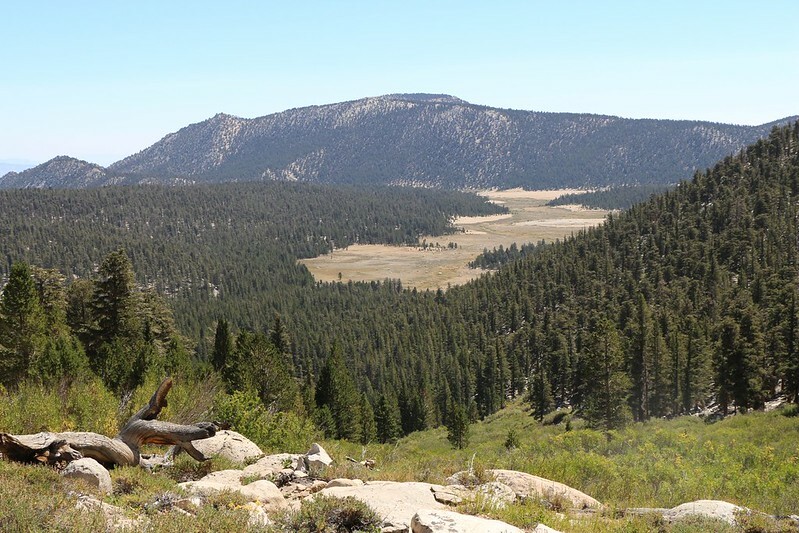 The past month had been extremely dry and there was very little water flowing anywhere, which is rare in the Sierra. It was dry and dusty and there were no views, so we didn’t want to stop. Still, we got hungry, so we compromised and stopped where the South Fork of Cottonwood Creek crossed the trail. It was nice to relax near the flowing water. Soon enough, we arrived back at the car at the Horseshoe Meadows Parking Lot. It turned out that the spot we’d picked wasn’t shady at that time of day, but we didn’t care as the weather was cool. Meanwhile, it was time to ditch those stinky hiking boots. We put on some car clothes and got ourselves ready for the long drive back home. 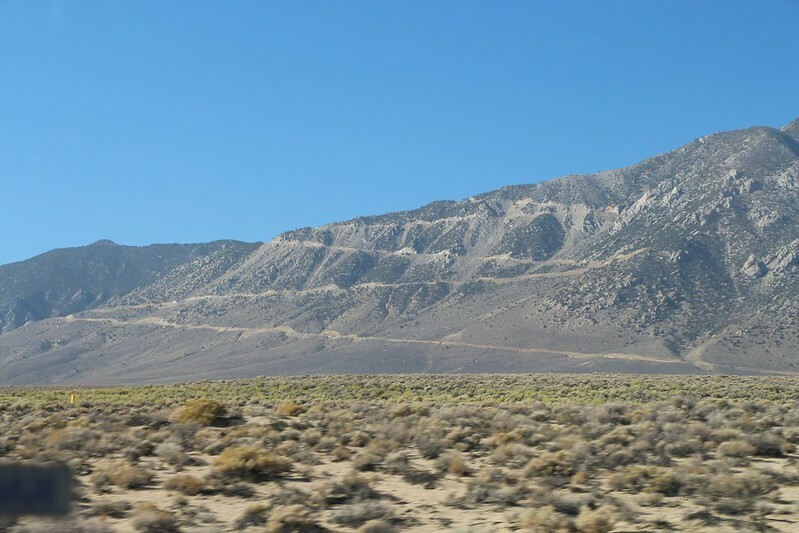 We headed down and down on Horseshoe Meadows Road, our ears popping again and again, as we made for the main highway in Lone Pine. Back at the car at the Horseshoe Meadows Parking Lot. Time to ditch those stinky hiking boots. But first, we decided to treat ourselves to a post-hike burger, so we drove all the way back uphill to the Whitney Portal Store. I’d never been up there, so seeing the Labor Day Madness was educational, to say the least. And the burgers were quite tasty. Too bad the store doesn’t sell Mount Langley T-Shirts, or we would’ve bought a couple. Then we got back in the car and headed home, a five hour drive. All in all, it had been a great trip. The weather was a bit on the cool and breezy side, but that’s fine when you’re climbing big mountains. When I got back home my wife wasn’t mad that I’d ditched her in favor of my son, and she seemed to be happier simply looking at all the pictures. Maybe she’ll even hike with me again sometime! 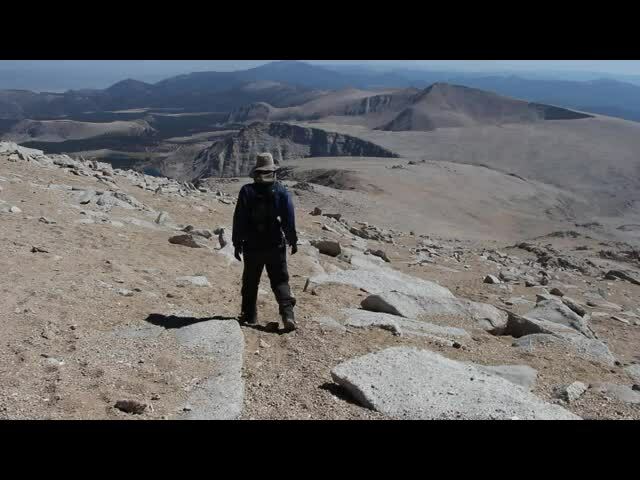 But the best part is that now my son is a fourteener, and can high-five his other fourteener buddies, or smile condescendingly at his other friends who have only climbed mere ten thousand foot peaks. Maybe someday, when they grow up, they, too, could be fourteeners.